In an interview on Branding In Asia, Martin Roll, author of Asian Brand Strategy, emphasized that brand-building is a strategic leadership responsibility. “I believe people often underestimate how difficult it actually is to build and sustain strong global brands, and to become truly brand-driven organizations. Especially Asian business leaders tend to believe that brand building is somehow a tactical exercise they can delegate to lower parts of the organization, and that results will show up quickly. They often struggle to understand the strategic nature of brand building, for which they need to direct and lead the efforts, and make profound changes to make it happen.” Although he was addressing Asian brands specifically, strategic brand leadership is a universal mandate. Two writers observed how today’s market dynamics are changing the way brands are built, but they described approaches that have distinguished great brands throughout the years. In Building A Modern Brand: Strategy, Creativity and Agility, David Armano reported on data from Edelman’s Brandshare study which concluded that today’s consumers look for and evaluate their relationship with a brand beyond traditional rational and emotional benefits into areas that veer into societal. Well over half of 10,000 consumers polled globally indicated that brands having a clear “mission and purpose” influenced how they felt about that brand. David then posed a timeless challenge: “Today’s marketers must ask themselves — does our brand stand for something? Does it stand against something else?” The best brands — Apple, Disney, Google — have crystal clear answers to these questions. In Branding in the Age of Social Media, Douglas Holt observed, “Iconic brands are cultural innovators: They leapfrog the conventions of their categories to champion new ideologies that are meaningful to customers. As a result, they enjoy intense customer loyalty and superior sales and profits, and garner loads of free media coverage. In business, few achievements are more prized than creating an iconic brand.” This is true now more than ever before. 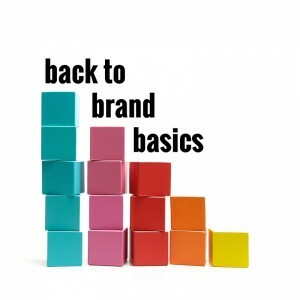 Have you come across other content about getting back to brand basics lately? Please share. P.S. As noted last month, I’ve introduced a new blog feature: a monthly recap of content that stood out to me in the weeks prior. In addition to the brain food I myself cook up, I wanted to share tasty bites from others. Hope you enjoy the buffet!